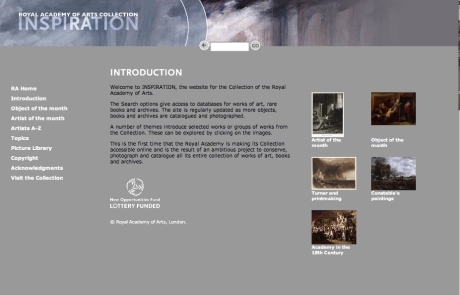 Launched in September 2008, this is a new online collection website which sits alongside the main, more commercial, Royal Academy site. The focus is on a clear and simple interface allowing effective access to the collections database. System Simulation's work with the RA resulted in a fully integrated website, pulling in information from many sources within the institution: the collection management system, the library system, the book system and the archive database. It also holds records carrying information about individual Royal Academicians. It is a rare example of integration and cross-searching of the many asset types found within a national institution, with the results collated and presented in easy-to-digest format. A search for "Constable", for example, returns results about Constable himself, plus all Costable's images in the collection, all books relating to Constable and even archive records which relate to the artist. Clicking on the search result allows access to the actual object record, archive page or collection record. The Royal Academy system supports SPECTRUM, ISAD(G), MARC and IPTC cataloguing. It shared terminology and other features across all of the components and allows for significant amounts of cross reference. Newly catalogued items are immediately available to the web and kiosk access systems. The key result of this exciting project, is that the RA's collections are now accessible online on its website. Visitors to the RA's Inspiration site can access and search information from the currently catalogued collections and view a great deal of supplementary material, including presentations by experts. The site is regularly updated with newly catalogues, photographed and digitised objects. System Sim. designed and developed interactive public access programmes and these are installed on touch screen kiosks in the galleries. These provide thematic insights and selected searches into the collections. For example, programmes for 'Turner and mezzotint', 'Constable and the RA' and the 'Singleton Portrait of Royal Academicians' are installed in the Fine Rooms.